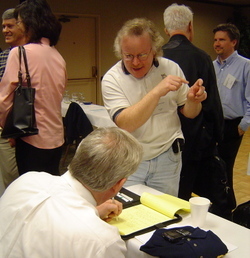 The meeting reached its 50 attendee target, a larger share of partners and consultants than customers. But for each seat of the 50 which were filled at the Doubletree Hotel on San Francisco’s bayshore, a few, a dozen or a hundred other HP 3000 customers were represented. The nine hours of networking, counting breakfast, lunch and the after-meeting supper, offered a view of the future with several destinations — and no certain end of life. 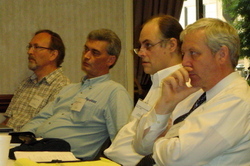 HP was well represented at the meeting, a full table of engineers, managers and experts sitting on the front row. Jennie Hou, HP’s e3000 business manager, updated the crowd on the vendor’s new offerings during 2007, a talk she delivered to far fewer 3000 community members during the summer's HP Technology Forum. Of course, back then, HP's limit to its 3000 business was the end of 2008, not 2010. The brightest sparkplug of the meeting, ScreenJet's Alan Yeo, (second from left, along with Transact creator David Dummer, Eloquence's Michael Marxmeier and Cavanagh) concluded the meeting with an insight. "I've often wondered why HP placed the e in front of 3000," he said. "Now I think I know. It stands for enduring, because the 3000 has lasted a darn sight longer than HP expected." HP's contribution to the day was hard to overlook. For all of its IO expert firepower, community liaison connection and even Ross McDonald's lab director oversight, the most moving expression of the day from HP came through a former employee who kicked off the meeting. Jeff Vance had lived in the HP mountaintop, and literally worked from there in his most lauded and productive years developing from home, before retiring in May. Just six months after his HP exit Vance stood before us to testify about how alive the future feels for him, all while a collage of 3000 division team members flashed on the screen behind Vance. The photos celebrated the retired and departed while making a case for how the end of life of work cannot be calculated when you love what you do. Lunch delivered the biggest torrent of networking, the brightest benefit which attendees could carry away from a surrended Saturday. A room buzzed with revivals and reports. Some of the brightest lights in the community exchanged updates of the future outside of the 3000 extension, as well as the personal reports on migration tricks that make networking such a solid extension of online relationships. Most likely among the homesteading risks, Sieler said, was that an MPE/iX vendor would go out of business unexpectedly. The irony of knowing that HP has been going out of its 3000 business, ever so slowly and carefully, but at first unexpectedly — well, that wasn’t lost on me. New ideas and updates on migration news arrived in crisp 20-minute talks. Each presenter seemed to understand that to run overtime would be denying the crowd a chance to hear more on a different solution, whether it was the emerging IT tool of Application Portfolio Management, explained and outlined by Birket Foster, or the advances in migration techniques and strategies, detailed by Chris Koppe. Very little of the day would have been possible without the generous sponsorship of companies like Foster's and Koppe's. The registration Web site was popped together, over a matter of days and including online payment options, by Speedware's Marketing Manager Dani Knezevic, who was on hand at the registration table to sign us in and distribute badges. Some attendees paid on the morning of the Meet. Other sponsors to help make the Meet happen: Yeo's ScreenJet, and Eloquence creator Marxmeier Software AG, as well as Micro Focus, now the focal point for migration-bound COBOL solutions. Absent from the room? The veiled dismay and outright anger at the vendor which sparked all this transition. The OpenMPE advisory sounded upbeat and hopeful, as well as full of new opportunities to network. 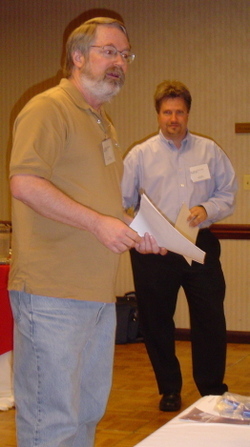 Best wishes got passed along to the GHRUG user group conference, still scheduled for March 14-15 in Houston's suburbs. Birket Foster and Matt Perdue drove through the slides that continue to make a case for an independent lab to on the MPE/iX source code, once HP is ready to transfer the software for patching. As we have said before, HP'S Service and Support sector has more to say about the licensing timetable than any other portion of HP. News came in modest amounts, like the explanation of COBOL enhancements to AcuCOBOL, offered by Acucorp whic now a part of longtime COBOL rival Micro Focus. Both companies sent representatives to the meet. While AcuCOBOL’s manager Bob Cavanagh fielded some pointed questions about licensing changes once the two companies merge to a single product, the intent of the answers seemed clear: the combined firms want to do what’s needed to speed and clear the path of migration of all those COBOL apps you run on 3000s today. The Meet succeeded in providing a forum for many folks to network together ... and even in the late days of the 3000, there are still vendors investing in the community and the community is investing in those vendors. I know that my Application Portfolio Management talk was well received and the Open MPE talk created a good dialogue both with homesteaders and HP.